Identical twins Caroline and Victoria Williams are so close they were born with their arms wrapped round each other. So when it came to planning their weddings, it was only natural that the sisters would have very similar tastes. In fact, Caroline got married a year before Victoria, but they both chose Shottle Hall and the similarities didn’t stop there. They chose the same church, the same photographer and the same florist and their ivory and strapless wedding dresses came from the same shop. 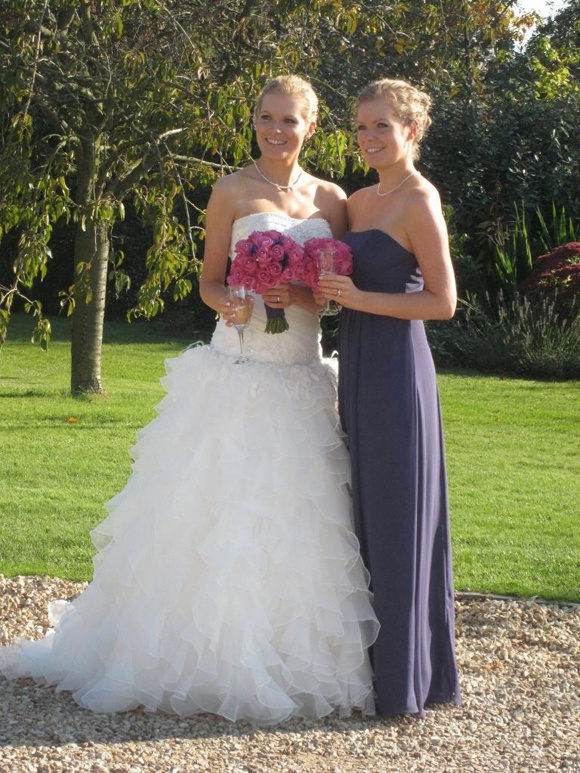 The twins both used the same cake-maker - who made them both cupcakes, rather than traditional wedding cakes – they hired the same DJ and they even had exactly the same number of wedding guests! Victoria said: “We are very, very close and speak to each other three times a day and text each other all the time! “I was born first but they couldn’t get us out because we were hugging and wouldn’t let go of each other! Dad mentioned this in his speech actually. Not everything about their weddings was identical: Victoria chose a hot pink and purple theme for her big day, while Caroline opted for a winter white, baby pink and silver colour scheme. And while Caroline’s wedding was on a cold December day, Victoria chose to marry in October and was lucky to get unseasonally hot weather. Caroline said: “Because we are so similar and have the same tastes it made it more special that our days were so alike. We did have some differences, but having so many things the same just made it more special for us. Of course the biggest difference between Caroline and Victoria’s weddings were the grooms – although luckily they are now close friends. Caroline’s husband Tom Roberts and Andy Law, who is married to Victoria, understand the special bond the twins, who are both 32, share. Proposal: Andy left me nine cards over nine consecutive mornings (as this was the number of years we had been together at the time) all dotted round in different places – I think one was in the cereal cupboard for instance. Each card had either clues regarding where we were going or little reminders of our past. He gave me card number 10 in the restaurant at the top of the Eiffel Tower which simply said ‘Will you marry me?’. Andy had told Mum and Dad he was going to propose, but they decided not to tell Caroline because we find it really hard to keep things from each other, even if we do it by accident, and he didn’t want to ruin the surprise. Ceremony: Caroline picked Hazelwood Church because it was near Shottle Hall. Because she had married there I thought it would be nice to do the same and it just made it all the more special. Caroline gave me the template from her Order of Service, so we both made our own. I was really nervous, but the vicar was lovely and totally put me at ease. I felt I was going to cry a lot, but I think my nerves stopped me. Shottle Hall: My sister looked round 11 venues before she finally picked Shottle Hall and it was the perfect place. Because we live in Sheffield I looked round loads of places nearby, but I just couldn’t stop thinking about Shottle Hall. In the end we decided we couldn’t better it and it was absolutely the right decision. I absolutely loved it there, everything felt really, really special. “The four of us spend a lot of time together and we even go on holiday together"
One of the most special moments was getting ready there in the morning– Caroline and I came down for breakfast in our dressing gowns, because we had the place to ourselves. It was quite a precious moment for us both. We had our wedding breakfast and evening do in The Orangery and absolutely everyone commented on how pretty it was. The food was lovely – just perfect. Dress: My dress was from the same shop as Caroline – a place called Choola in Sheffield – and I got it on exactly the same weekend as my sister actually, just a year later. The staff remembered us so it was lovely. My dress was by Mark Lesley and was strapless and quite fitted at the top with little beads and little pearls and frills on the bottom. 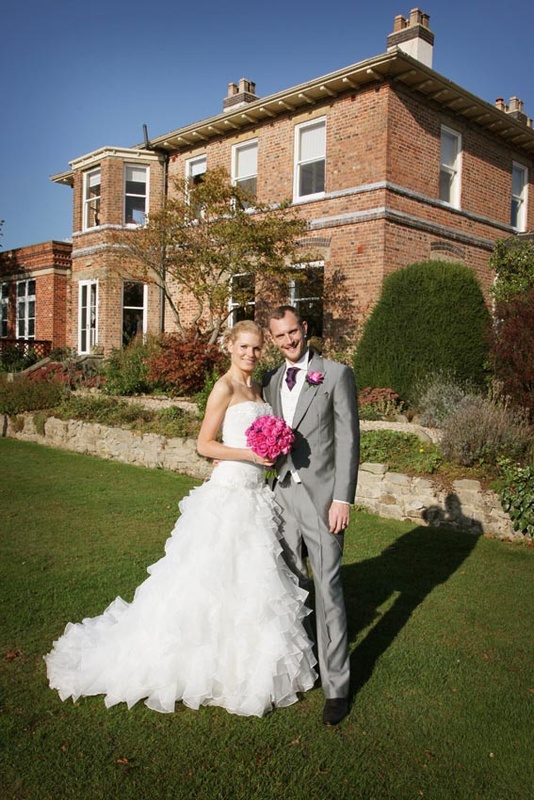 Suits: Andy had a pale grey morning suit, with a purple cravat and pink rose in his buttonhole. We hired them from the same place as Caroline, Formal Affair in Nottingham. actually saw my ring in the window of a jewellery shop as I was walking past. It is a three stone diamond and platinum ring and I loved it as soon as I saw it. Andy has a plain palladium ring and I have quite a plain wedding band. We got all the jewellery from Edward James in Sheffield. Caroline’s ring is very different actually – she has a solitaire engagement ring and her wedding band is very sparkly with lots of diamonds embedded in it. Hair and make-up: We did our own make-up for both our weddings. For my hair I used a salon called Boudoir in Sheffield. I wanted my hair to look different to Caroline’s was on her wedding day but it was quite difficult because I kept thinking of hers! Best man: Jamie Mchale who has been Andy’s long-standing friend. They were friends in Derby and now Jamie lives in Sheffield too. He was a great best man and the speeches were terrific – they made everyone laugh. Andy was also best man for Jamie too. 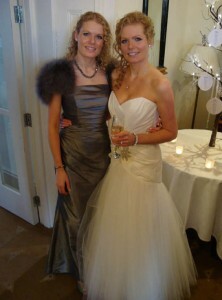 Bridesmaids: My sister was maid of honour of course and I had been her chief bridesmaid! I also had three other bridesmaids and a flower girl. They wore purple dresses from Berketex, in Nottingham – I do a lot of shopping in Nottingham because that’s where Caroline lives. Flowers: I used the same lady as Caroline from the Blossom Tree She was absolutely brilliant - really good. I had hand-tied pink roses and purple lisianthus with pearls in it. The bridesmaids had little hot pink versions. 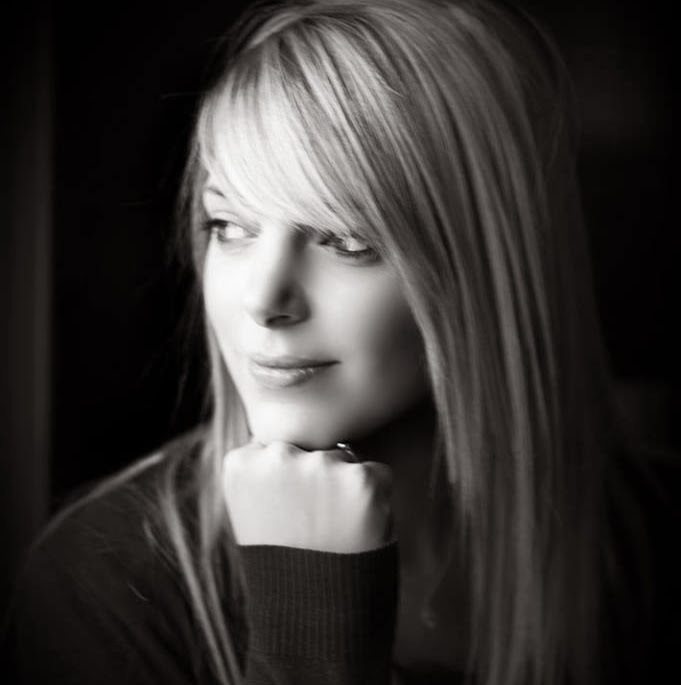 Photographer: Both Caroline and I had Matt from Field Photographic and he was great. We have ended up with quite a different set of pictures though, because my day was mostly spent outside because it was so sunny and Caroline’s was much more like a winter wedding so a lot of the pictures were taken inside Shottle Hall. Reception: After the church we had a Bentley for our journey to Shottle Hall. We all had drinks and canapés outside – we couldn’t believe the weather, it was fabulous. We had 72 people for the day, which by coincidence was exactly the same number as Caroline. Our meal was delicious; we had tomato and mozzarella salad to start with, chicken for the main and raspberry-laced crème brûlée for dessert which was really nice. Our family dog Basil, a Jack Russell was there too – I wanted him in some of the photos. He had a matching collar and lead – he comes everywhere with us and so came to both our weddings. Favours: Caroline’s favours were cookies in the shape of baubles, candy canes, snowflakes and wedding dresses. They were very glittery and tied with ribbons and names tags, so they doubled-up as place settings too. My favours were hot pink and purple chocolate balls, which I put inside little bags tied with purple ribbon. I loved making them and pinched Caroline’s name tags too! 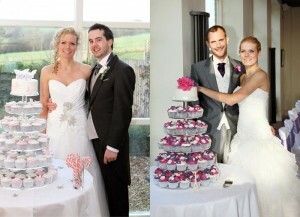 Cake: I had cup cakes like Caroline, from a company called Cookies and Crumbs in Coventry. Caroline found them at a wedding fair at the NEC and their cakes are really divine with all different fillings in them like Baileys and chocolate. I had 120 of them altogether, they were little works of art. We both had a top cutting cake as well – mine was a plain cake with pearls and hot pink and purple roses on the top. Evening: We had 116 people in the evening and a disco from Spirits High. Our first dance was to Al Green Let’s Stay Together. Memorable moment: The speeches – someone recorded them and they are lovely to listen back too. Andy’s speech was quite emotional and my Dad told lots of little stories about both me and Caroline growing up. I think for both of us the other memorable moment would be sharing our special days with each other. Honeymoon: We went to New York which was amazing. I’d never been before and it was great. The weather was really nice, sunny, autumn weather. It snowed the day after we left so we were quite lucky. Caroline was proposed to in New York, so that was quite nice too.